A banh mi becomes a Philly cheesesteak. Egg rolls are stuffed with spicy Korean pork. South Park’s Phorale takes fusion to another level. Phorale looks more like a place to buy a pack of Camels and a Powerball ticket than a lunch spot. And for a second, I thought I’d been had by friends who sent me to a convenience store in South Park as a practical joke. A “Vietnamese-TexMex fusion” sandwich shop? Ha, you got me. But here it is, a lunch counter situated near the aisles of Slim Jims, Budweisers and Pall Malls, with dudes hawking egg rolls that riff off chimichangas and fusion banh mis. Former roommates Jimmy Bui and Young Cho started Phorale. Their original goal was to do banh mis with Korean barbecue, and in March, they found cheap rent when a friend agreed to sublet a corner of his convenience store. 8909 14th Ave. S., (South Park) Seattle; open Monday-Wednesday 11 a.m.-6 p.m. and Thursday-Saturday 11 a.m.-9 p.m. Closed Sunday; 206-519-0810 and on Facebook. Since opening, their concept has expanded to include culinary influences from Mexico, Japan, the U.S. and perhaps another country of their own imagining. It’s a cornucopia of different comfort food, recognizable, just reconfigured differently. Many are banh mis with meat marinated in spicy Korean flavors, topped with Mexican or Tex-Mex condiments. Food is more street-stall inspired than gourmet. But you’ll find more hits than misses on the menu. It’s worth a trip to South Park. The menu: Two appetizer ($5-$8) options: egg rolls stuffed with spicy Korean pork and fries with your choice of spicy pork, pulled pork or bulgogi; pho ($7-$9) comes with rice noodles topped with an egg, enoki mushrooms and choice of steak, spicy pork, garlic pork belly or tofu. The banh mis ($8) are served with the Mexican bolillo bread, stuffed with different proteins and sauce combos. Added soon will be a Vietnamese coffee-flavored creme brulee for dessert. Don’t miss: The Fuego comes with pickled veggies but deviates from a traditional banh mi with chunks of pork marinated in a Korean chili-paste and cilantro aioli. It’s a salty, creamy bite, a five-napkin affair. 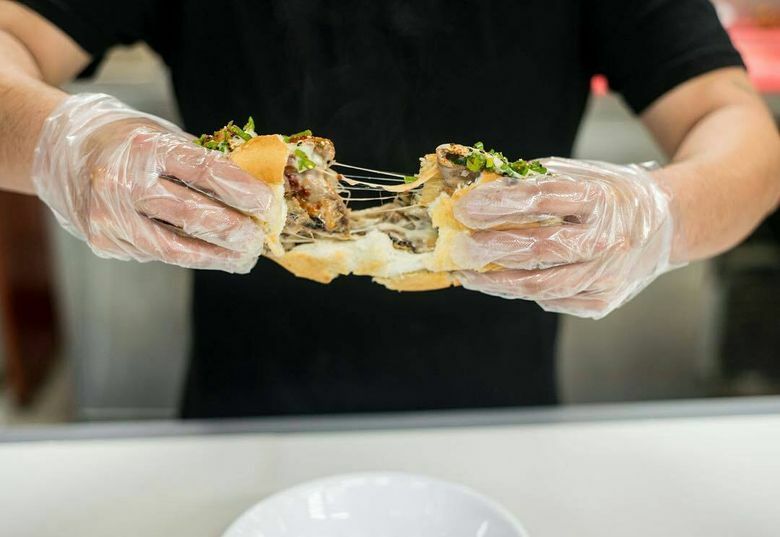 A play on the Philly cheesesteak, The Gringo comes with sautéed onions with a béchamel in place of a cheese sauce and squirts of cilantro aioli and an Asian sweet-and-spicy sauce for a kick. Curly fries here might be more glutinous than poutine, coated with habanero béchamel and topped with spicy pork, avocado crema and salsa verde. 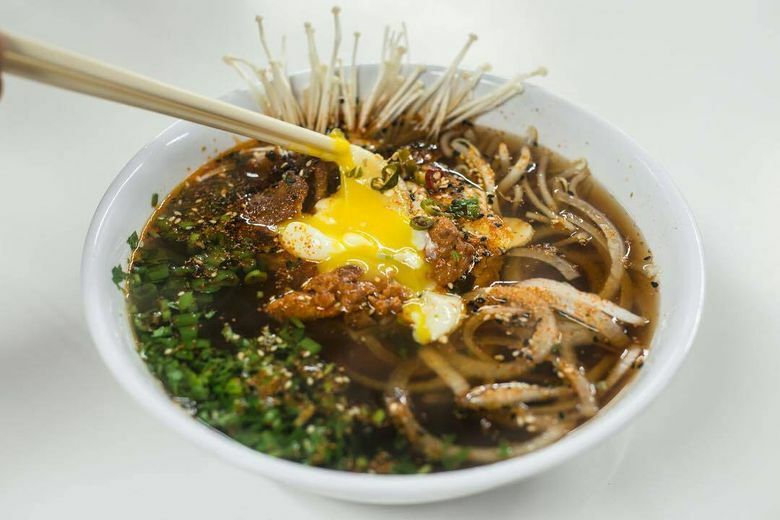 What to skip: The seaweed-based broth in the pho-inspired soup was bland, lacking the umami punch and the fat and seasoning to bind with the ramen toppings (sous vide egg, garlicky pork belly and enoki mushroom). Prices: A sample menu of three banh mis and the pho totaled $32, before tax and tip, enough to serve three to four for lunch.